Ringing alarms and the smell of burning rubber forced occupants of University Corner to exit the building unexpectedly today. At three this afternoon, occupants of Wits’ University Corner Building on the corner of Jorissen and Bertha streets were rushed out of the building following a fire in the building. “The alarm rang in our building and we thought nothing of it. But then I went to investigate more and I saw smoke coming out of the lift,” said Juliet White who is an events coordinator at Drama for Life. 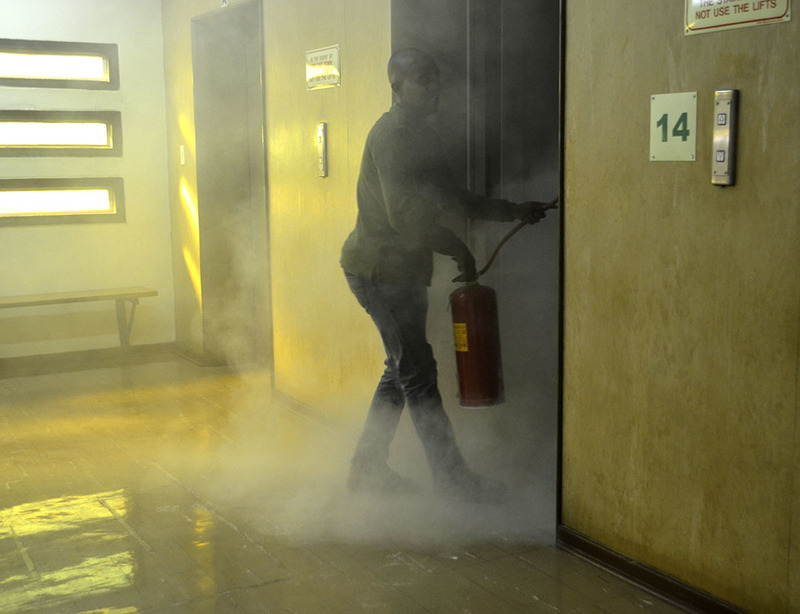 White’s colleague Zandile Bekwa then called Wits emergency services to notify them about the smoke. “I called the emergency services and they said we should just wait and not move,” said Bekwa. She said they waited for a few minutes as the smell of the smoke became more potent and they decided to leave the office. “We decided to take the stairs down to ground floor because we got a bit nervous when we saw the smoke,” said Bekwa. On their way down stairs the ladies met James Bekes a technician from Britefire Security who told them to exit the building as there had been a fire in one of the three lifts. Bekes said a small electrical fire had started in Lift B on the 14th floor due to a faulty control panel, which made the buttons burst into flames. He said they had been called at 3:05 PM and had arrived on scene five minutes later. “I cannot confirm what created the electrical fire but we were called to come handle the issue,” he said. 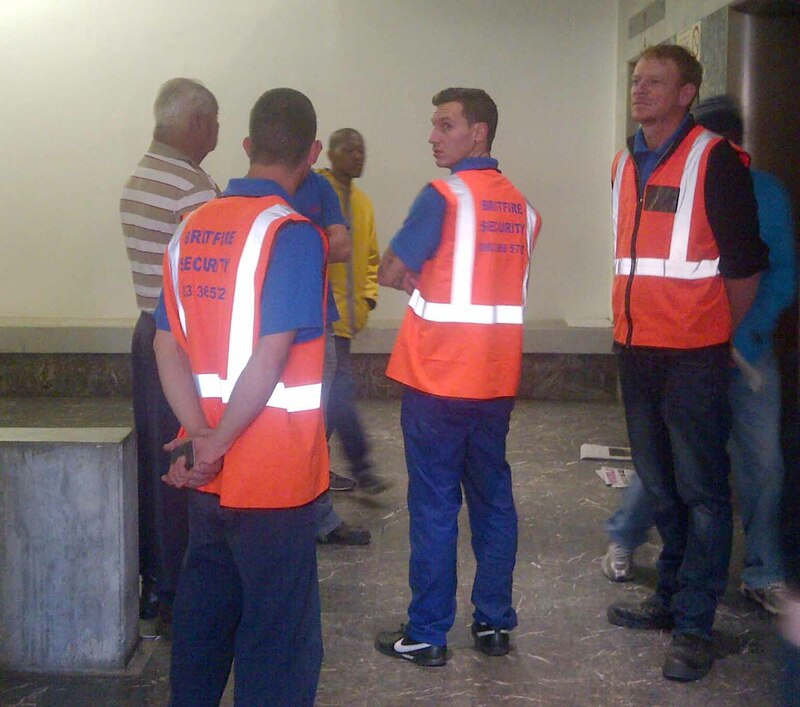 Last month Wits Vuvuzela reported that faulty lifts in the building were leaving students, staff and tenants frustrated. 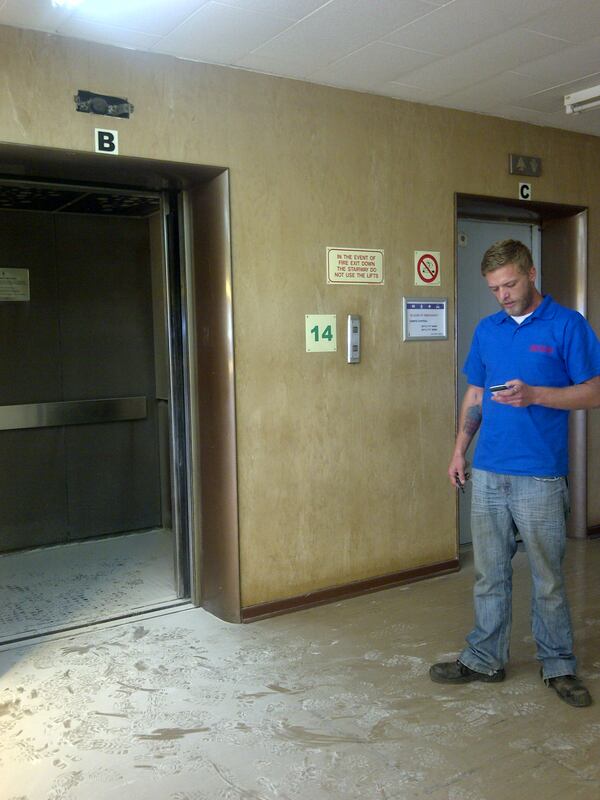 Eddy Kekana, technical supervisor for the Property and Infrastructure Management Division (PIMD), said the lifts could only be fixed one lift at a time and that each lift would take up to six months to fix. Wits Vuvuzela has since learned that lift B which started the fire is not the lift that was being repaired, but rather the lift students and staff have been using throughout the year. 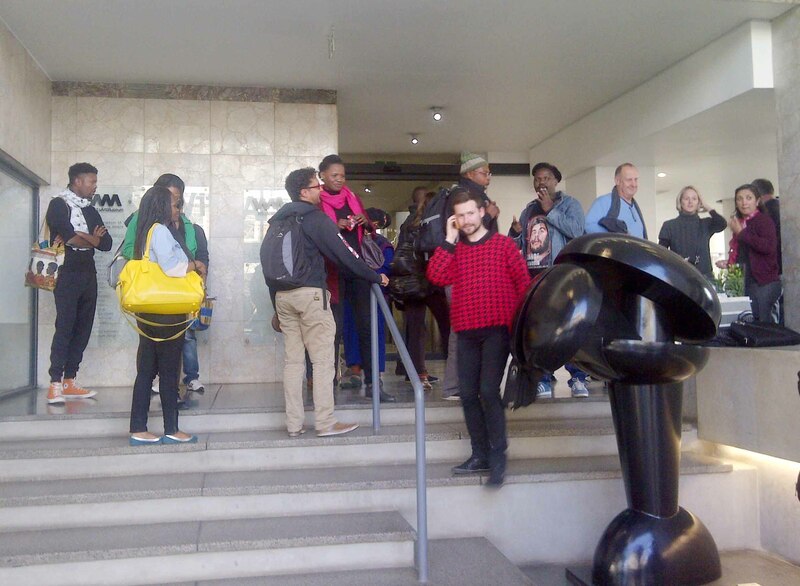 As technicians attended to the emergency, a group of people waited in the reception area of the Wits Arts Museum. Nick Rumpelt, 3rd year Music student, they were rehearsing on the 8th floor and they were notified about the fire by a classmate who bumped into some people rushing down stairs. “Basically we found out about the fire via word of mouth, no one official like security or the technician came to notify us,” said Rumpelt. Carlo Mombelli, famous South African bassist and music teacher at Wits was told not to enter the building when he arrived to give a lesson. “I think they might be waiting for somebody to get killed before they fix the lifts,” he said. It was only at 5pm after 2 hours that occupants were allowed to re-enter the building. 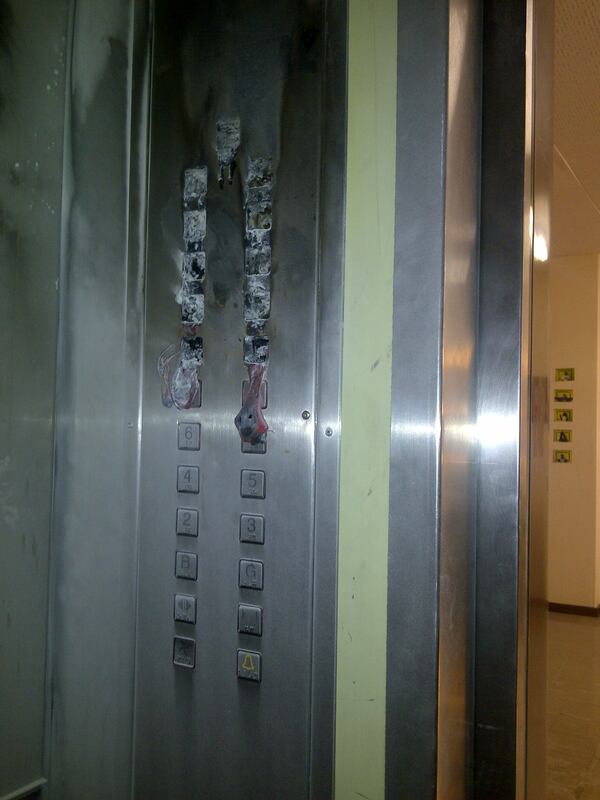 Only one lift remains functional in the 21 storey building, however students and staff are reluctant to use it following the fire.